Louis Vuitton Trophy teams drew for race pairings at a press conference and cocktail evening at the Royal New Zealand Yacht Squadron tonight, ahead of the first day of competition tomorrow. The draw, before a packed house in the Squadron’s Westhaven clubhouse, also decided which teams will enjoy the preferred starboard entry before their starts. The pairings for the first races tomorrow of the seven-day round robin are: Mascalzone Latino Audi Team (NZL92) vs. ALL4ONE (NZL84), Azzurra (NZL92) vs. TEAMORIGIN (NZL84), Emirates Team New Zealand (NZL92) vs. Artemis (NZL84), ALEPH Sailing Team (NZL92) vs Synergy Russian Sailing Team (NZL84). The eight teams completed their second day of boat orientation and training in mixed conditions today in the waters off the mouth of Auckland Harbour. The crews encountered calms at times in the convergence zone at the harbour mouth as weak sea breezes from the Pacific and Tasman coasts fought to get established. The forecast for the first day of racing is for light southeasterlies, increasing during the day. Winds are expected to increase later in the week. 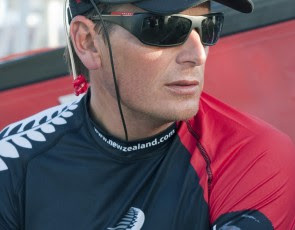 Dean Barker, skipper of host team Emirates Team New Zealand, and the winner of last year’s Louis Vuitton Pacific Series, said his team had its work cut out for it. Ben Ainslie, skipper and helmsman for Britain’s TEAMORIGIN, said it was great to be back aboard the Kiwi boats despite the day’s challenging conditions. Like Ainslie, Kiwi skipper Gavin Brady who is steering Mascalzone Latino Audi Team, has had months of experience in Cup boats in Auckland. While Ainslie formerly trained with Emirates Team New Zealand, Brady spent time working up BMW Oracle Racing’s USA98 in 2007. Frédéric Guilmin, strategist for ALEPH Sailing Team, reported a northeast wind between seven and 12 knots today. “We've been lucky because the guys in the morning didn't have that much wind but the weather this afternoon was great for sailing," he said. Every day in the Louis Vuitton Village, a jumbo video daylight screen will display live TV, plus 3-D Virtual Eye tracking from the race course, along with expert commentary and analysis. There will be two coffee grinder winches like those on the Cup boats for visitors to test their strength and grinding technique. There will be knot tying demonstrations, face painting, teams information, a results board, plus the latest results from on the water. About 45 minutes after racing finishes each night, the public can take part in the evening press conference, which will also be shown on the jumbo screen. The public will also have an opportunity to mix and meet some of the world’s best sailors and get their autographs. Every day, one of Emirates Team New Zealand’s America's Cup yachts will moor at a dock on the edge of the Village after racing to unload its crew and sails. The boat will remain at the Village overnight for public viewing before it is towed to the team base at 7:00 am for bottom cleaning. Times may vary according to the state of the tide. LIVE Sport Sailing 103.0 FM will feature all-day live coverage from on the water. On television, during the seven days of the round robin, TVNZ will carry nightly reports on its sports news. From March 16, during the elimination rounds, TVNZ will feature nightly half-hour reports. For the finals on 20th and 21st March there will be live coverage of the racing from noon to 4:00pm. Live streaming web coverage of the Louis Vuitton Trophy in Auckland is available on the event website, http://www.louisvuittontrophy.com/. The official site (in English, French, Italian and Russian) is also rich in team content, as well as features, audio, video and images.